An exciting new technique is developed and validated for exploring cancer aetiology. Over and above the combinations of aging and modern living ( diet, environment and lack of exercise) as defined by the new so called ‘internet penetration algorithm’ , excess cases of cancer in Europe and Australia are shown to be quite strongly due to indoor gamma radiation and excess cases the world over are shown to be due to alcohol and lack of sunlight. Possibly up to 36% of world cancers could be avoided if people simply had adequate vitamin D status. In the author’ s opinion it is high time the media hype on dangers of sun exposure were played down or ended. I have recently established that percentage Internet Penetration per Capita is a highly accurate predictor of World cancer incidence, R circa .9. The value of this regression factor increases further and quite dramatically if nations which don’t consume alcohol are removed from the sample up to a limiting value of about .96. I have proposed elsewhere that this perhaps surprisingly high regression value is due to the fact that internet penetration is an excellent pointer of both a nation’s wealth and hence a tendency to have an aging population prone to cancer for numerous reasons including but not exclusively; poor melatonin and vitamin D status due to mainly working indoors and in radio frequency fields and artificial light, poor diet including processed food nitrosamines, trans fats etc. and being exposed to emissions form furnishings such as formaldehyde and phthalates and being generally physically inactive. An ideal facet of the regression is that it enables one to generate an expected value of cancer incidence for a given population with a given internet penetration per capita Hence to calculate excess cases (positive or negative) over and above this value. The number of excess cases (X) are than give simply by the actual number of cases per hundred thousand observed (O) minus the calculated incidence (I). Unfortunately, accurate data on natural radiation sources is only known for certain countries in the world other than those due to very radioactive hotspots. The best data set available seemed to be that detailing just Europe and Australia. Thus the Cancer/Radiation aetiology study can only be limited to these countries. 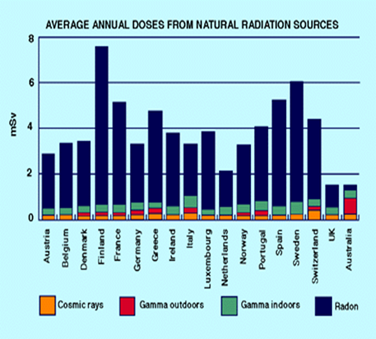 The average annual radiation doses are shown below in Figure 1. The number of excess cases X for all the countries on the list was then separately regressed against relative Radon concentration, total Indoor and Outdoor Gamma Ray availability and the Total Indoor Gamma Ray availability. Indoor Gamma, figure 2, showed the best correlation with a regression factor R= circa .75. For the summation of total Gamma availability, figure 3, the Regression factor was somewhat less at R=.47. For radon concentration, figure 4, the data was anti-correlated which is perhaps initially somewhat surprising but will be explained below. Taking agriculture and the construction industry as the main sources of outdoor work only 11% of European individuals work outdoors. 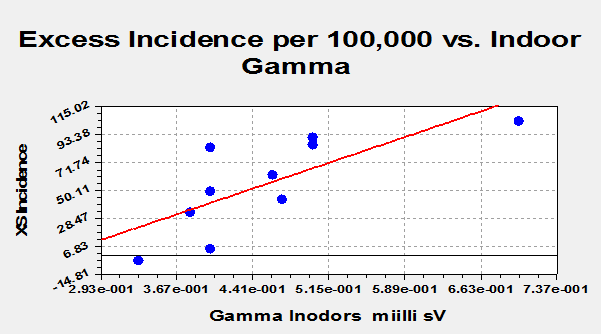 There is no significant correlation between Gamma radiation indoors and Gamma radiation outdoors in figure 1. Furthermore because on average more individuals work indoors and all individuals other than shift workers are indoors during the overnight period, therefore on the basis that Gamma radiation causes DNA damage and mutations more of this should be seen indoors. This is borne out in the observed highest Regression factor, figure 2. The R^2 value for gamma indoors implies that 56% of excess European and Australian cancers over and above those predicted by the Internet Penetration algorithm are due to Indoor Gamma radiation. Excess cancers are negatively correlated against Radon concentration. Radon is essentially an Alpha and to some extent Beta Emitter. Radon (Rn222) does an alpha decay into Polonium (Po218) with a half-life of 3.824 days. Polonium (Po218) does an alpha decay into Lead (Pb214) with a half-life of 3.05 minutes. Lead (Pb214) does a beta decay into Bismuth (Bi214) with a half-life of 26.8 minutes. Polonium (Po214) does an alpha decay into Lead (Pb210) with a half-life of 164 microseconds. Lead (Pb210) does a beta decay into Bismuth (Bi210) with a half-life of 22.3 years. Bismuth (Bi210) does a beta decay into Polonium (Po210) with a half-life of 5.01 days. Polonium (Po210) does an alpha decay into Lead (Pb206) with a half-life of 138.38 days. Radon has mainly been associated with Lung cancers but I have recently also shown a strong correlation with malignant melanoma. Alpha particles must be inhaled to initiate lung cancer but Beta particles being stopped by the dermis could be implicated in Melanoma However, both lung and melanoma cancers only form a minority percentage of the total of all cancers considered in the original algorithm and both are strongly correlated with other factors. The R^2 for figure 5 suggests that globally some 29% of cancer incidence could be alcohol related. One reference ………quotes that up to 21% of cancer deaths worldwide could potentially be related to alcohol. These figures are quite comparable, hence tending to support/justify the new technique developed here. The result based on R^2 figure 6 suggests that up to 36% of cancers worldwide could be avoided by exposure to a high solar UV index. A high UV index is synonymous with people having a good vitamin D status. Also if they get more sun in the morning they are likely to have a good serotonin and 5-MTT status, hence good melatonin status at night. I have stressed the importance of vitamin D as an anti-cancer agent elsewhere. Once again this newly developed technique and its hypotheses would appear to be supported/justified. Using an Internet Penetration Algorithm developed in one of my earlier publications and multiple sequential linear regressions I have established excess European and Australian cancer incidence in terms of a radiation aetiology and I have shown that only Gamma rays indoors are statistically significant in the case of all cancers. 56% of excess European and Australian cancers over and above those predicted by the Internet Penetration algorithm are due to Indoor Gamma radiation. I have further employed the technique to examine the effect of alcohol on world cancers. Potentially up to 29% of all cancers could be in some way alcohol related. The figure is some 30% higher than that established elsewhere. The usual arguments that alcohol impurities such as acetaldehyde are chemical carcinogens probably apply together with the fact that alcohol dissolves the carcinogens in tobacco smoke and forms, for them, a more efficient vector into the body. My guess is the additional figure may be wrapped firstly in the fact that alcohol reduces vitamin adsorption and secondly that it increases promiscuity adding particularly to the developing world burden of STI’s which are linked to cancers of the cervix. Finally, I have established that up to 36% of cancers worldwide could be avoided by exposure to a high solar UV index. A high UV index is tantamount with good vitamin D status. Also if people get more sun in the morning they are likely to have a good serotonin and 5-MTT status, hence good melatonin status at night. Both these circadian hormones in addition to vitamin D are powerful antioxidants and anti-cancer agents.